Tactile keypads are a crucial element of accessibility for people who are blind and visually impaired. Apple has shown that a touchscreen can be made accessible, but in the absence of tactile keypads, significant swaths of today’s technology and electronics are off limits to persons who cannot see, and to others with disabilities as well. As with many ubiquitous elements of the built environment, we often fail to appreciate the origins — or the originator– of the technology we rely on. This is certainly true for tactile keypads, or it was true until a fascinating obituary of a post-war engineer named John E. Karlin was published in the New York Times earlier this month. Mr. Karlin deserves credit for birthing today’s tactile keypad. According to the Times, “Mr. Karlin, associated from 1945 until his retirement in 1977 with Bell Labs . . . was widely considered the father of human-factors engineering in American industry.” In that capacity, he helped identify and solve many issues related to the telephone: how long should the phone cord be? What is the best layout for the numbers on a rotary-dial phone? How can the process of dialing a telephone be sped up? Want to learn more? Read the full obituary in the New York Times. An accessible telephone keypad has tactile marking including a raised dot on the five key and detailed size and spacing requirements that are not mentioned in the Karlin obituary. But the building blocks are all there in his work. Next time you use a keypad, you can thank John E. Karlin and his team at Bell Labs. The California Financial Code requires that all point of sale devices in the state be equipped with “a tactually discernible numerical keypad similar to a telephone keypad.” Read more about California tactile keypad law. 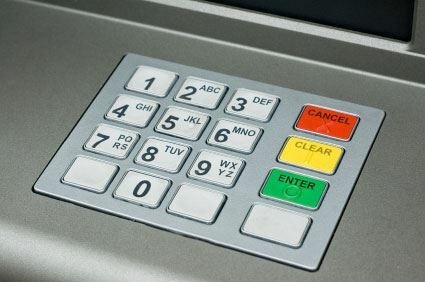 The Law Office of Lainey Feingold and Co-counsel Linda Dardarian have negotiated close to a dozen agreements with national retailers requiring telephone-style keypads at point of sale devices so that people who are blind do not have to disclose their PIN when using a PIN-based card. Read a summary, with links, of the tactile point of sale press releases. Telephone style keypads are a core element of Talking ATMs. Read a summary, with links, of the Talking ATM press releases issued as a result of Structured Negotiations.